My Whites XLT is a surviver. It was originally manufactured in the 1990's and purchased new by a man named Carrel, who used it to find twelve different Civil War cannon balls that were still intact before selling it to me. His original program is still on the machine. I mostly use it for coin hunting. It has some great factory set programs, but you can also create your own programs and save them for the life of the detector. I did have to repair the detector a few years ago. The display screen stopped functioning, and there still is a slight short that causes the machine to turn off on it own without warning once in awhile. However, it has been through a lot of hunts including when it was raining, cold, and windy. I mostly use the standard coil to find silver dimes up to 5" deep and quarters up to 8" deep. With the Big Bertha coil (15" coil), I found a 1912 Wheat penny 12" deep. The drawback is the detector is less stable with the larger coil, and much heavier to swing. I have not found a lot of silver because most of the areas I hunt are public parks that have been heavily hunted already, but the machine does go crazy when silver is under it. It sniffs out silver very well and sings loudly and proudly. I have also probably paid for the machine by now from all the clad coins I have found. Just this past year, I found 100 quarters in a one single city park in just four 2-hour hunts. It is no longer the top of the line detector on the market, but it still is one of the best ever made. It was way ahead of its time, and still is better than most. Really, unless you are shelling out big money for a top end detector, you are not going to match the Whites XLT. A few newer detectors selling for under $400 do get better depth, but they cannot discriminate as well as the XLT, so you dig more trash with those machines. Only the top end detectors are better to be honest. Not bad for a machine over 30 years old. This machine is Unique and Beast who has made this metal detector put a lot of dedication on it and made EQUALITY AND POWERFULL Beautiful machine and weighs nothing compare to others metal detectors. Perfect for GOLD NUGGETS. If you detect a hotrock just (switch hotrock and Leave it normal Hot Rock Adjust Knob) FIRST for Ground Balance put the ground balance knob in the middle with a machine off now Turn the GROUND knob clockwise 4 full turns RIGTH>>. Set the THRESHOLD knob full down <> until you hear a steady background hum, then stop. You want it to be clearly audible, but not loud. Best in the middle Close to 1 o'clock you need to use headphones for better Accuracy I recommend small headphones for better sound for this metal detector. NOW Gently "bob" the coil up and down 1 to 4 inches above the ground surface in a spot that looks typical, and where there is probably no buried metal. Keep the coil level and parallel to the surface of the ground as you raise and lower it. NOW Slowly rotate the GROUND knob counterclockwise DOWN <> until you are familiar with the sound and feel of the null zone. Then set the GROUND knob in the middle of the null zone. You are ready to begin searching. NOTE: You MUST use the GROUND knob correctly or you will hear the sounds of the ground everywhere. Hopefully I explained And hopefully that helped -_-? I have been detecting since mid 70's. I have used just about every detector out there and I still come back to the Whites Spectrum and my whites 6000di sl pro. You just can't beat GEB discrimination. Most detectors use TR and Pulse and whites was the first to use GEB and it's still the best to date. Find you a good XLT and you won't ever need anything else. The VCO pinpointing is awesome. I have dug silver walking liberty halves at easy 10 to 11 inches. I won't ever waste anymore time or money on any other detector. This is as good as it gets. This is one great machine! I picked one up and it's already found some cool relics, silver and coins. Awesome discrimination in trashy areas. One of the best deepest machines ever! I have found a German helmet six feet deep. It has ready to go programs for the novice but you can also play with it and make hundreds of changes, its so versatile that you cannot get bored. I have a dfx also which is the same as good but with an extra frequency that makes it a bit better on gold and a couple other features that make it more stable when I crank it all the way up. THE BEST MACHINES MONEY CAN BUY!!!! Just the best machine ever, once mastered it can be what ever you want it to be, a switch on and go machine, or program it to suit what ever site your working on. Been using the XLT for some years now, after detecting for some 25 years. Had all sorts before the XLT, but the good old XLT is by far the best detector I ever had. I've got it set up with a program suitable for the type of ground over here (relics deep), and don't fiddle with it anymore. I guess that's the trick, don't try to change to much in the settings, if it works fine it works fine! The problem with a complex detector like the XLT or the DFX is that you are always afraid you detecting in the wrong mode, got something wrong in the settings. Just don't go crazy on the settings, if it works fine its works fine and don't change anything. Another thing, try digging the low VDI's, often these are good targets too! Found a nice chuncky bronze fibula that only came up as a 3 on the VDI! It's simple. I've been treasure hunting for over thirty years. I have a real job, and now my findings are matching my annual salary. (AND I HAVE A REALLY GOOD JOB). I have nearly 30 detectors and the rule is, "LEARN YOUR MACHINE". 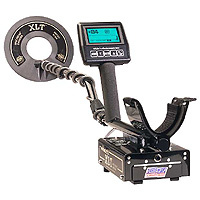 The White's XLT is a manipulative detector. You can change and modify programs better than any other, but you have to know what you are doing. That comes with experience, and it will go deeper. The question everyone has, AND I MEAN the Hard question is, can my purchase pay me back my investment? The answer is,YES, if you are a winner. Research your target area and work it like a job you love to do. I worked two years finding nickels and dimes, and worked one afternoon finding $12,500.00. To date my findings are (Sold prices, not numismatic values) $201,057.00 and I do it with my wife and kids, which means the value of my life is ten fold. Programing is the ticket on this machine, no other machine can compare. Have used them all over the years and the XLT is by far the best. Bought a used xlt in great condition, took a little longer for the learning curve to kick in, but its worth taking your time and reading the excellent manual. Top marks to whites! Have used Tesoro, Minelab C-scope, Fisher and these machines are all great, but I believe that every machine out there really wants to be an XLT, quite simply a lot of machine for a little money. I just cant put it down, and when you cant get out, your still messing with it at home, changing programs and trying them out. Definitely one of the best and most enjoyable machines ever made, and one of the best I have used, (don't like the coin program though, too much discrim. )but there are lots of fine programs out there to load up instead. p.s. Will buy a new one and put it in the cupboard, just in case they stop making them, now that would be a REAL BIG MISTAKE, just get one, you'll love it!